The story of BLACKLIST ROCK starts in the late 90’s with two very different bands based in a small town called Springs in South Africa. Liaan Horton started a band called ZEN with a few school friends in their senior year at High School. It wasn’t too long before they were playing their original Moderate Rock compositions influenced in parts with a slight punk tone to everyone who would listen. In a short time ZEN built up a strong local fan base and notched up 42 club gig’s in 11 months….. Not too bad considering the whole band was still busy completing High School! In the summer of 2000 Zen recorded a demo album and soon afterwards split up due to musical differences and personal reasons. Meanwhile in the same town brothers Dewald and Karel Koekemoer started Thrash Metal outfit ANTOCRAT along with Joel Jones, Etienne Rabbi and a few friends. They wrote technically solid Thrash songs with strong Death Metal undertones. ANTOCRAT achieved legendary status in the local Metal scene between 1997 and 2000. A five track EP entitled “Gods of War” was recorded and self distributed by the group. Late in 2000 ANTOCRAT disbanded due to unforeseen circumstances and events. Early 2001 Dewald (Guitar) and Karel Koekemoer (Drums) along with Joel Jones (Bass) joined up with Liaan Horton (Guitar & Vocals) to write a few songs and continue under the ZEN name. Obviously there was an interesting change in the music and the band immediately started playing gig’s all over the Gauteng region. All Major clubs at the time where covered including The Doors, Roxys, Big Easy, Nile Crocodile, to name but a few. Festivals followed and the band also played many gigs opening for bigger acts including a stint with Seether (Saron Gas), Wonderboom, Sugardrive and others. The ground work and foundation for BLACKLIST was being laid, even though the band members weren’t aware of it then. That same year Liaan Horton met Adrian Adams while studying Sound Engineering together. Adrian was an excellent and well schooled guitar player influenced by 80’s style Lead Solo’s and Modern Riff’s. Soon a friendship formed that would form the foundation for BLACKLIST’s song writing. In 2003 Zen finally ceased to exist and the members took a break to decide on their musical futures and current situations. Later that same year Liaan (vocals), Dewald (Guitar), Karel (Drums) and Adrian Adams (Guitar) decided to start a new Band with a clean sheet. Jaco Slabbert (Bass) entered the fold leaving his previous band CREATION, and so BLACKLIST was born……. BLACKLIST then decided to start writing songs they wanted to hear and to develop a unique sound that defines BLACKLIST. Vowing not to cheapen their music the group decided to stay in their own studio and perfect their art until they felt musically fulfilled. Every song is a personal expression for every band member and defines what BLACKLIST is all about. The revived group of talented musicians known as BLACKLIST finally set out to spread the word in 2007. Playing Mostly far from their home base. A few gig’s in and around Pretoria followed, including Music Festival appearances at “The Moonrock Festival” and the annual “Six Feet Under Festival” This was a definitive period for the band as they decided towards the end of 2007 to head into the studio and start recording their first E.P. Blacklist set out to record 7 tracks on their self titled first release, it took them two months to lay all the tracks at their Springs based studio…Completing the album was very hard since as mentioned before everything from the recording, mixing, art work and advertising was completely done independently by the band. Then 2008 happened….Blacklist launched their independent self designed Website www.blacklistrock.com and also started playing more shows as their popularity started to rise. Mid 2008 they entered the “Durex Ultimate Battle” competing along with 120 of South Africa’s best unsigned bands. BLACKLIST went on to win a spot at the “Lucky Fish Music Festival”. While this was happening the band started developing a reputation for their extremely intense and emotionally driven live shows, the word spread and the “BLACKLIST army” started to emerge content with the knowledge that BLACKLIST play and represent them. On the 1st of May 2009 BLACKLIST finally released the E.P. they worked so hard on. In keeping with the theme of the album they independently planned and funded the event along with a lot of friends and some corporate sponsorship. The E.P. Launch was a huge success and paved the way for the first BLACKLIST music video (also funded independently). The video was shot on the 4th and 5th of July 2009 and amounted to a 23 hour shoot. Directed by Liam Davies it was themed to capture a moment reflecting the period the band was in and also rounding of the E.P. by sealing it with the video. In that same month with the video completed for the BLACKLIST song “Forget” one of the other crowd favorites “God Knows” was made available for free download by Microsoft Windows. This was done as part of their “Sponsored songs program”. The E.P. was also made available through most online retailers. Having completed the first goals they set for themselves the band went into the studio to start writing new material for their first full album due to start recording in December 2010. The writing process was extremely grueling since the band focused on not holding back and writing exactly what they felt and wanted to hear. Both professionally and personally the members themselves were feeling the strain. This all eventually came to a head early in 2011 when longtime lead guitarist Adrian Adams left the band midway through recording the long awaited full length studio album. The remaining members then decided to take a break from the studio to decide on the best way forward. After deliberation it was then decided that the band would not replace Adrian. 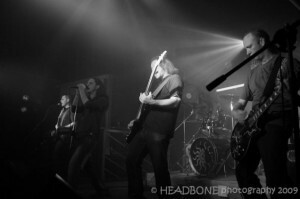 Vocalist Liaan Horton would share guitar duties with Dewald Koekemoer both live and in the studio. The dynamic of the band cannot be compromised. After a few months of refocusing and very hard work Blacklist Rock went back into the Audio Vibez studio late November 2011 to finish this potential beast of a album. With much more experience and knowing how things work both within the band dynamic and the South African rock industry BLACKLIST plans on unleashing a Rock masterpiece on not just South Africa but the world in 2012 …. Being musically and mentally mature now as musicians and people. BLACKLIST is ready to take their progressively driven Modern Rock with Hard hitting lyrics and memorable Chorus hooks to the next level. Through many up’s and downs, numerous Gig’s and countless hours of playing as one BLACKLIST have gathered a massive amount of experience and this shows in their utter professionalism and dedication. With their stripped down beautifully raw material BLACKLIST is ready to set out and do what they promised each other and started working for in 2003! In A nutshell BLACKLIST is a group of very experienced passionate and driven musicians. As individuals they have become very close and encourage each other’s creativity. BLACKLIST do not believe in empty words and superficial commercially driven music BLACKLIST is about being real and reaching nothing less than the top of their musical evolution.